This chapter describes the rationale for induction chemotherapy in head and neck cancers, and offers a detailed account of the evolution of systemic and regional (intra-arterial) chemotherapy in this field. Emphasis is placed on representative trials but a range of successful experiences have indicated that there should be great potential for use of intra-arterial induction chemotherapy given not only as perfusion or chemoembolism, but also as method in parallel to radiotherapy, with the objective long-range cure or worthwhile palliation. 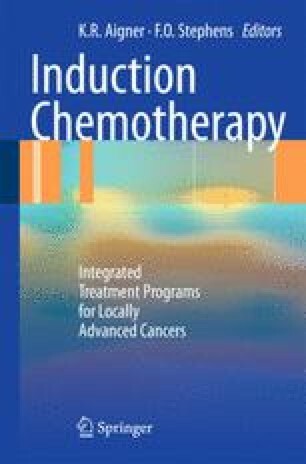 According to most recent evidence, systemic induction chemotherapy has proven advantage in unresectable head and neck cancer and in case of larynx preservation, and intra-arterial chemotherapy has high merits in the treatment for regionally advanced and recurrent cancers and should be considered as preoperative induction treatment in management of resectable cancers of the oral cavity and anterior oropharynx. German Cancer Society, Head-Neck-Tumors, Treatment 2009 [Deutsche Krebsgesellschaft, Kopf-Hals-Tumoren, Therapie 2009]. (http://www.krebsgesellschaft.de/pat_ka_kopf_hals_tumor_therapie,108203.html).